In this paper we propose a multi-objective evolutionary algorithm for supporting the definition of a personal income tax reform. As a case study, we apply this methodology to the Italian income tax, and consider a recently implemented tax cut. Our optimization algorithm can determine a set of tax structures that maximize the redistributive effect of the tax while minimizing its inefficiency—considering for the former the Reynolds–Smolensky index and for the latter the weighted average of taxpayers’ effective marginal tax rates. The approach also takes into account two additional factors: the tax has to guarantee a specific revenue and to minimize the share of losing taxpayers with respect to the pre-reform situation. 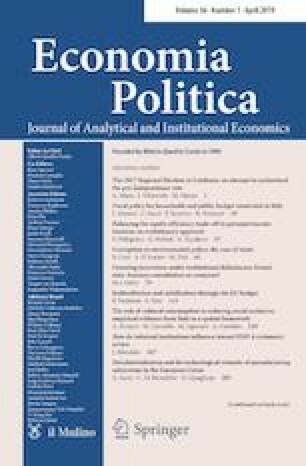 Experimental results demonstrate that the methodology we employ can support the policymaker’s decisions in complex, real-world situations. We would like to thank Giampaolo Arachi, Massimiliano Piacenza, Gilberto Turati, Achille Vernizzi, and two anonymous referees for their useful comments that helped us improve the paper. Partial funding for this project was provided by the Natural Sciences and Engineering Council of Canada (NSERC) through its Discovery Grants program. While working on this paper, Guido Perboli was the head of the Urban Mobility and Logistics Systems (UMLS) initiative of the interdepartmental Center for Automotive Research and Sustainable mobility (CARS) at Politecnico di Torino, Italy. Squillero, G., & Tonda, A. (2016). Divergence of character and premature convergence: A survey of methodologies for promoting diversity in evolutionary optimization. Information Sciences, 329, 782–799. https://doi.org/10.1016/j.ins.2015.09.056. http://porto.polito.it/2622368/, http://linkinghub.elsevier.com/retrieve/pii/S002002551500729X.